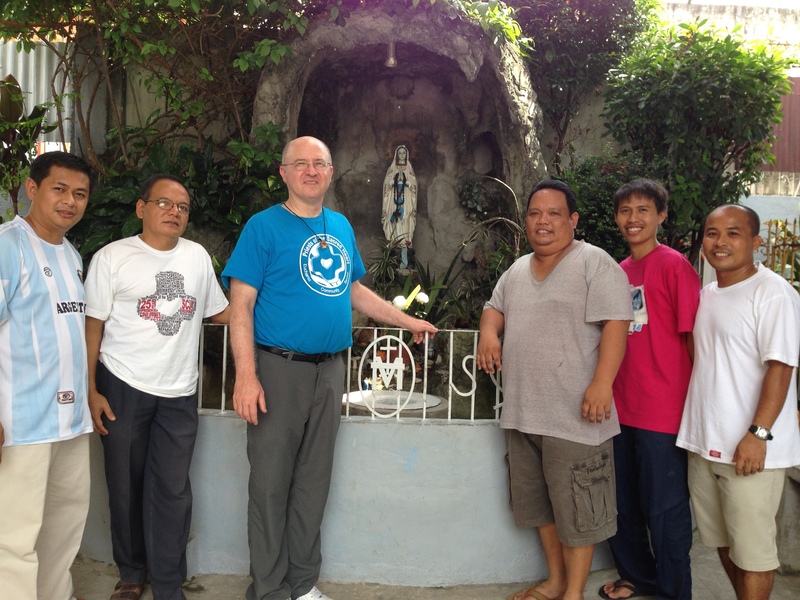 Seeing the impact of SCJ community in the Philippines | Walk with us! In the past few days I’ve traveled using many different modes of transportation. I write this from a bunk in a cabin on a ship bound overnight for the Island of Mindanao. The Philippines consists of over 7,000 islands, and in many places, water is the primary means of passage. 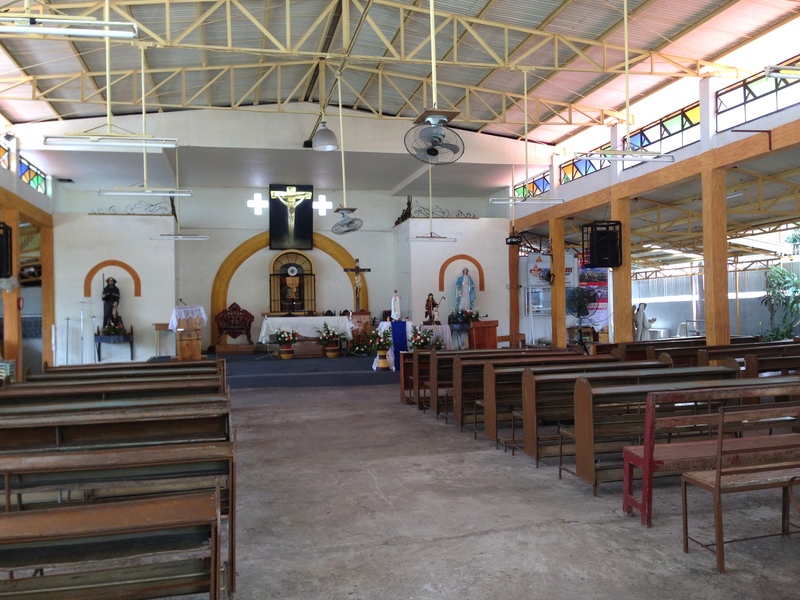 Monday we toured an SCJ parish on the outskirts of Manila. St. Roque is in the Bagonsilang district of Caloacan City. Fr. John Karl, the pastor, tells me that there are 50,000 families here in one of the densest parts of the city. He, Fr. 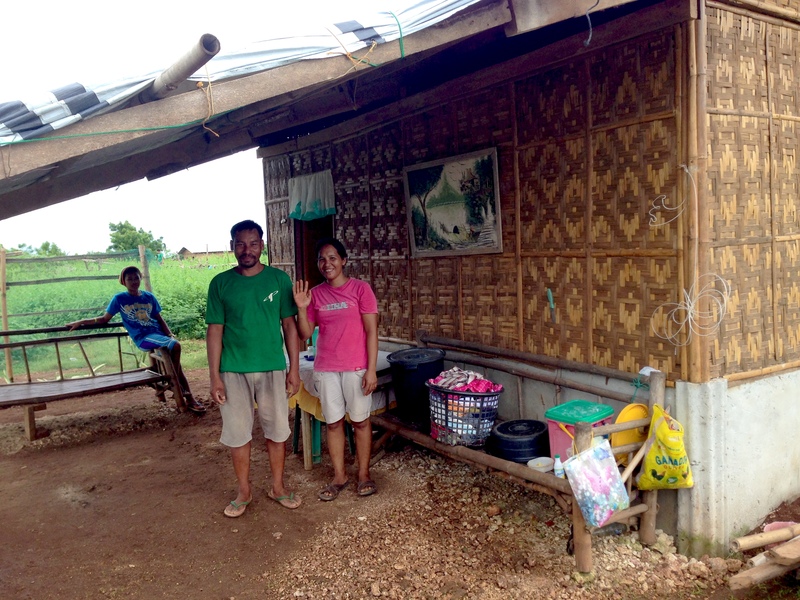 Nino and Deacon Chris live in a simple concrete block structure from which they reach out to the needs of their flock. We arrived shortly after the feeding program for elders and youth. A worker was putting the finishing touches on a shower that homeless people could use. They also participate in a government program to sell, at cost, rice to poor families. They take seriously Fr. Dehon’s call to get out of the sacristy and go to the people. We flew to Cebu City and began a three-hour drive to the other side of the island where we caught a ferry and motorized tricycle to a remote part of Bantayan Island devastated last November by hurricane Yolanda. 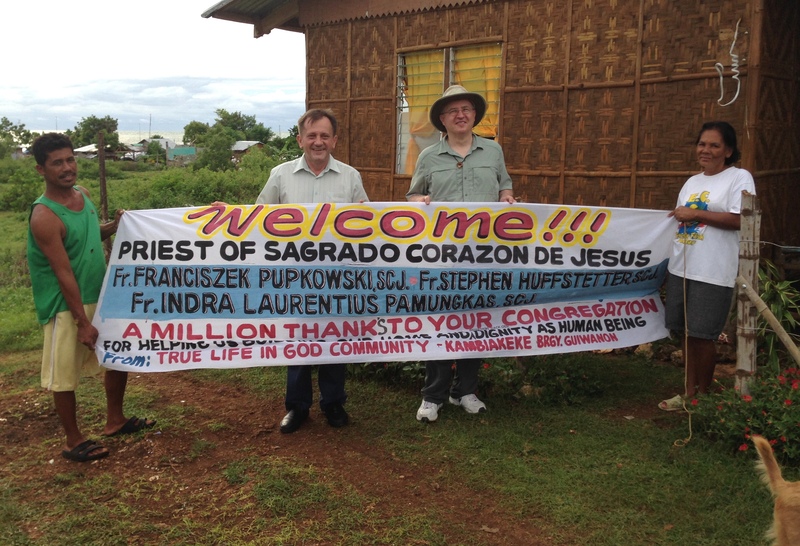 Working with the group “True Life in God,” the Priests of the Sacred Heart have helped sponsor and build 72 homes in two locations. 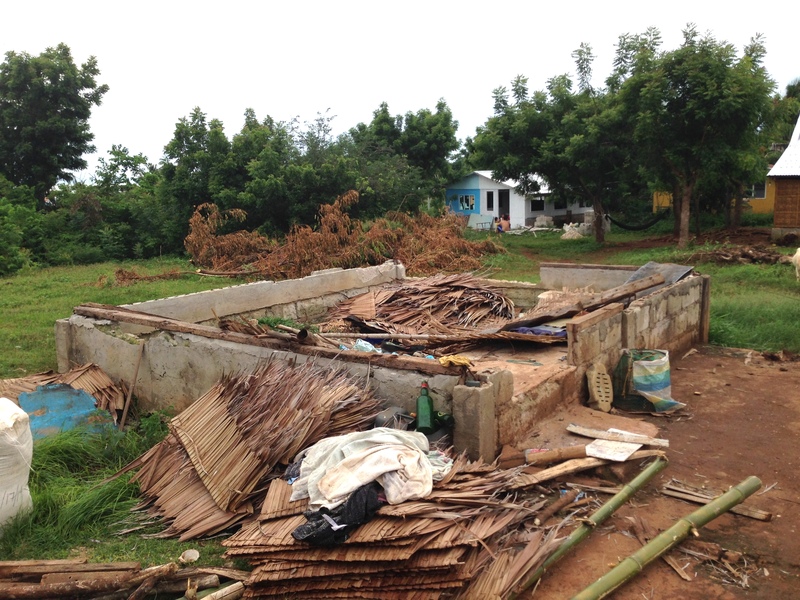 Built with the labor of the affected families themselves and volunteers, people can have a basic cinderblock and bamboo/ plywood home for about $1,200. Francis, an architect who is giving his time to the project, and his wife, Beth, were our hosts and guides. The government has been overwhelmed by the scope of the devastation so it has been necessary for private charities to step in. The first three months after the hurricane were merely relief efforts, making sure people had food and water to survive. It wasn’t until June, six months after the disaster, that people began moving into their homes and rebuilding a life for their families. Many of the men fish the sea for a living, and most of the village boats were destroyed as well. With the size of the homes, and many children sharing one room, I was reminded of my past ministry in Cherry Creek, SD, on the Cheyenne River Indian Reservation. Besides seafood, people tend goats and plant gardens and gather nuts and bananas from the countryside. Groves of bamboo provided housing and furniture material. As we visited one home I was amazed to see a middle aged woman scale a 50 foot palm tree in a matter of seconds to break off some coconuts and send them crashing to the ground. While life is simple and poor here, I see people with joyful hope and gratitude. It’s humbling to see tears of appreciation and receive credit when it was not I but our generous donors who have made this project and many others throughout the world possible. In the first location we stayed in one of the homes built to house volunteers who work with the communities. The amenities were very basic, yet the view of the sea and volcanic islands was priceless. A small gecko perched on the ceiling above. I was told not to worry because they are friendly. The first night villagers sat around us to tell the story of what they experienced in the aftermath of Yolanda and how they’ve begun to rebuild their lives. While I didn’t understand the language, except for a few brief translations, I could see in the emotions and expressions of how traumatic the devastation was. Yet many people spoke of how it has also pulled them together as a community and deepened their faith and they have emerged stronger and more united. The second location was on a small island. 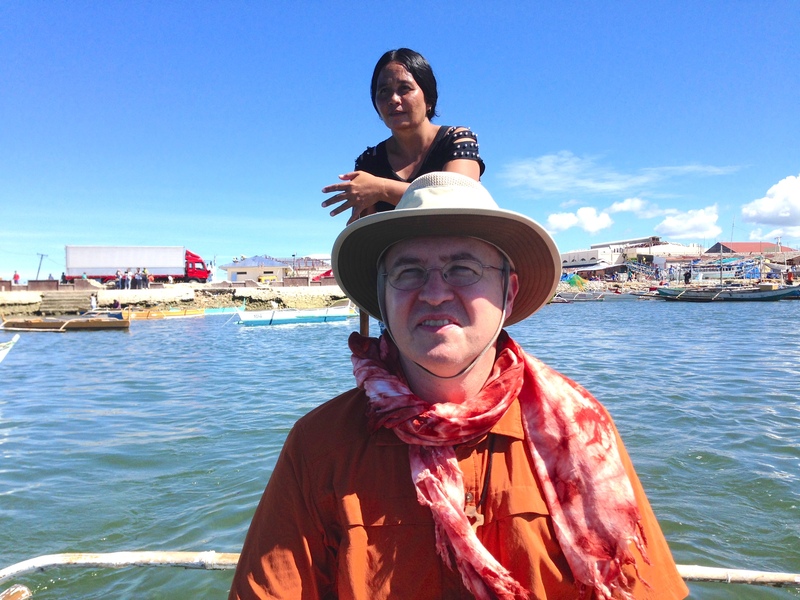 I climbed aboard a small wooden outrigger canoe and a young man used a long pole to propel us across the shallow waters. Children gathered under a tent provided by UNICEF as their school. I laughed to hear them singing the same ABC song I learned as a child. Part of the reconstruction was the building of a chapel and folks were gathered waiting our arrival. I was given the chance to address the community and tell them of our prayers and solidarity. 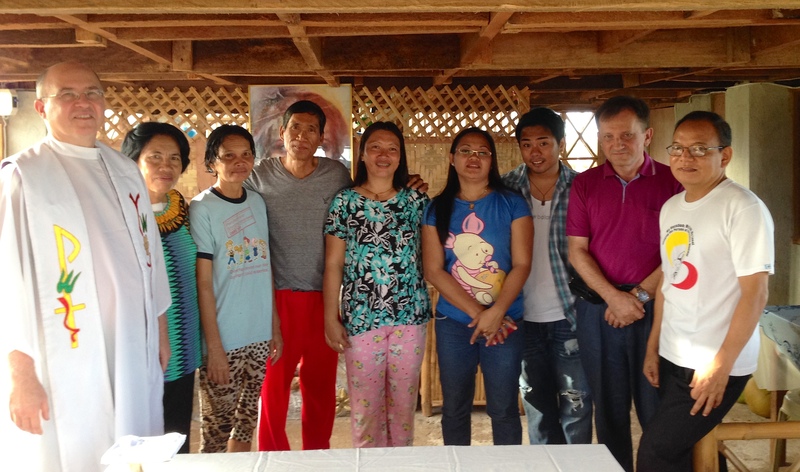 Several of the typhoon victims then recounted their stories of survival. We toured the homes that have been rebuilt so far, and the makeshift building where families on a waiting list slept. There is still much work to be done. All of the homes had a picture of the Sacred Heart of Jesus enthroned in a prominent place, and a few had carved or painted an image of a heart on the door. When we returned to the chapel, the women of the village had each brought some of the day’s catch: fresh crab and squid and shrimp, other fish I didn’t recognize, along with fruits from the area. The Filipinos brag that their mangos are the world’s best and I won’t argue with them!